About a month ago Michelin called and offered FLATSIXES.com a trip to Dubai to test their new Ultra Performance tire; the Michelin Pilot Super Sport. 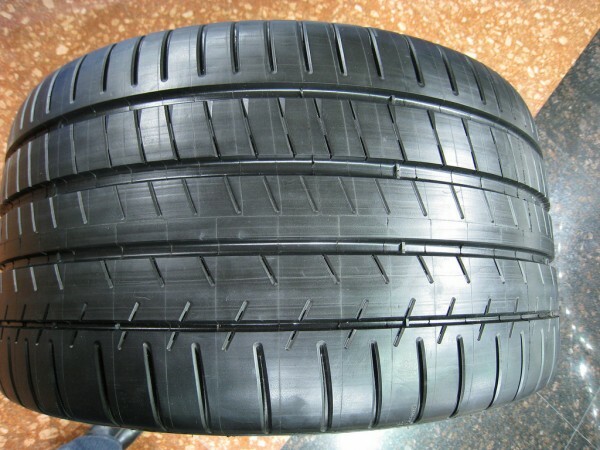 Knowing of Michelin’s long standing partnership with Porsche, and that this tire is likely be a future original equipment fitment on some of its top end models, we eagerly accepted. Prior to the event the French tire company was tight lipped and details were few and far between. All we knew was that Michelin would take care of all our travel and accommodations so we could focus on testing these new tires on vehicles we know well; the Porsche 997 Carrera S, 4S and Turbo. An even bigger tease was the chance to play with some ultra rare exotics. We were not disappointed. Michelin, Get a $70 Prepaid Card! 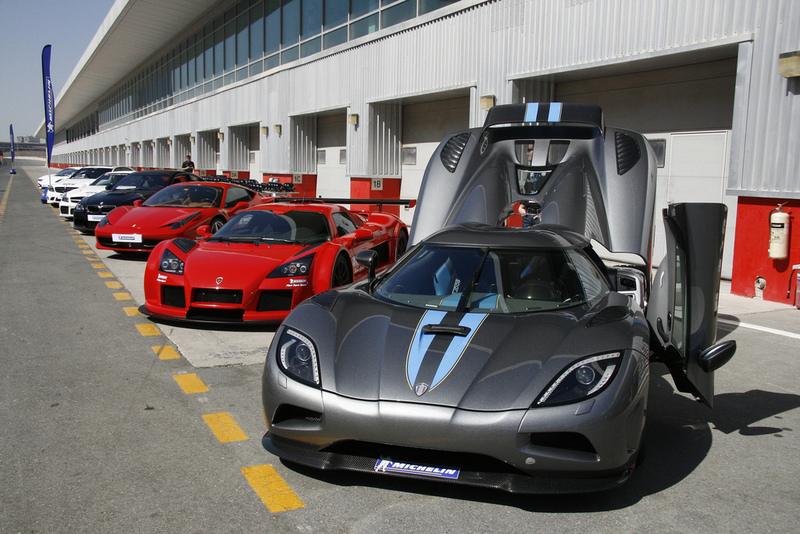 The chance to see Dubai, test a new tire and play with fast and exotic sports cars (especially at Michelin’s expense) was too great an opportunity to ignore. Leaving Michigan early evening, I arrive in the United Arab Emirates a short 15 hours later along with representatives from a select group of Porsche and automotive media outlets. Besides the obvious, part of what makes this trip unique is the eclectic group of automotive press, car club representatives, bloggers and professional drivers gathered together by Michelin. My first taste of both the track, and the tire I flew thousands of miles to try, comes via a Porsche 997 Twin Turbo with ceramic composite brakes and the fancy pants center lock wheels. I jump right in with Michelin test driver, and Porsche expert, Daniel Golebiewski. As we pull out onto the track our discussion revolves around the design goals of Michelin to maximize initial turn-in grip and high speed stability. After an exploratory lap we increase the pace, intentionally going too hot into corners to induce a slight understeer. Despite certain forum entries to the contrary, there is a need, and a desire, for slight understeer. You see, in order to truly maximize corning speed a capable driver needs to have confidence that the vehicle will not rotate too early in the corner, allowing the fastest speed possible on track out. However, like many other things in life, too much of anyone thing is bad. For that reason excessive understeer forces slower turn-in speeds. The 997 Turbo is a great platform to demonstrate tire and car working in conjunction. Balance and grip are evident no matter how harsh the inputs. For example, even while abruptly lifting off the throttle in a corner the Porsche still tracks its line where you might otherwise expect the rear-end to break loose. That’s not to say you can’t force the matter. In one of the more extreme corners at the Autodrome, a slightly uphill, left hand, bowl-like sweeper, you can break the rear-end loose with ease by simply goosing the throttle (tapping deep into the 500 available horses) while applying a slight counter-steer in order to hold a fast, controlled slide through the corner. 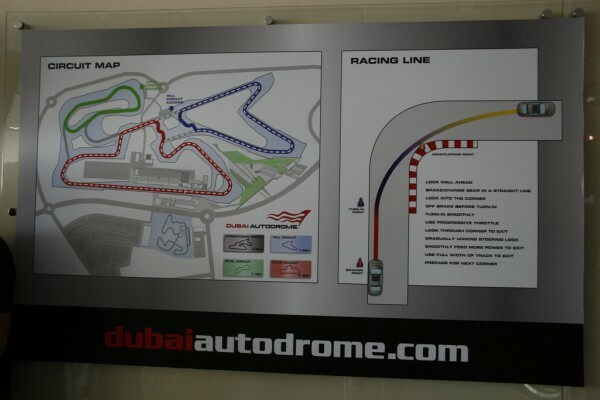 The main straight of this FIA circuit makes for a great high speed slalom course. At a somewhat absurd 145 mph, the Turbo is completely balanced and behaved while weaving side to side from outer edge to outer edge! How can a 3500lb car be this stable at this speed? It's not just the superb balance of the Porsche. The tires play a crucial role. That’s not to say that the Porsche Turbo’s 3.8L powerhouse, and its larger than life 380 mm carbon fiber brakes, aren't able to overwhelm the new Michelin a bit on high speed entry, enticing the ABS to get a workout, but this could easily be avoided with a smoother transfer to the brake pedal. One of the main goals for Michelin with the Super Sport is to improve wet grip over previous models. In the North American market most consumers are generally more concerned with dry grip. Conversely, the European market pays particular attention to wet performance. Our next test pits nearly identical Audi TTs against each other. One is shod with the new Pilot Super Sport and the other with Continental ContiSportContact 5 Ps. I drive the two Audis back to back, on the same wet circuit, with dramatically different results. The Super Sport is actually somewhat boring compared to the Continental. This, in case you're wondering, is a good thing. The Super Sport is particularly confident in the wet. As I transfer from the primarily wet skid pad to another with small intermittent dry patches there is little drama and I’m able to stay very tight to the inner radius. Simple throttle control allows for a gentle increase or decrease in my radius. Performing the same exercise on the Continental results in much more flair. The slip angles are much bigger and the transition from grip to slip is much more abrupt. The Continental feels a little vague and is harder to keep the Audi on a consistent line in the wet as compared to the new Michelin. The Continental’s subtle lack of grip may be more impressive to on-lookers but the Michelin clearly has the advantage in this test. Cornering speeds and stability are great but nothing without the ability to stop in a controlled manner. Michelin’s Pilot Sport 2 already has very good dry braking, the idea that the Super Sport improved upon this by a full three meters (56 mph or 90kph to 0 tested on Michelin’s test track) is astounding. 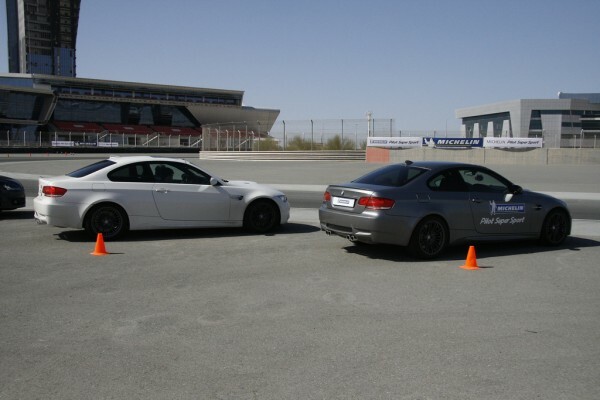 Our weapons of choice for this test are identical E92 V8 BMW M3s. To ensure accuracy the cars are outfitted with Performance Box data acquisition systems to measure braking distances and confirm entry speed. I set the BMWs cruise control to maintain 90kph (about 55 mph) and complete a series of both wet and dry runs to measure distance relative to the Pirelli P Zero tire. While dry, both tires manage neck jerking, grocery tossing stops. If not for the Performance box the only difference I could point out is the activity of the ABS. The Pirelli tire is definitely more active under hard braking and thus the ABS works much harder. 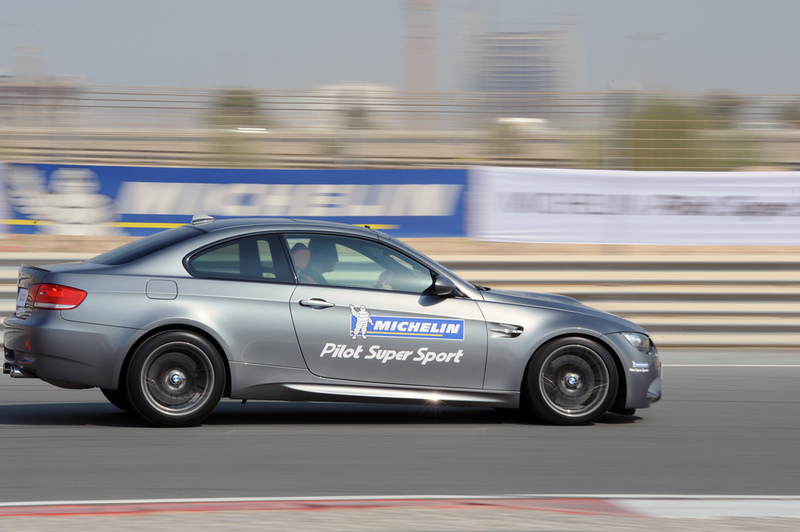 Surprisingly I’m able to stop 2.2-2.3 meters shorter on the Michelin Pilot Super Sports. Given my experience in dry conditions I expect similar results while wet. Judging from pedal feel, braking distances seem consistent with my dry results. However, despite the car being very active under braking I’m able to break 1.1 meters shorter on the Pirelli in the wet. Huh? I’m still a bit perplexed by this and would like to explore this further, but as my physicist friend says “you have to trust the data.” Later in the day my confusion lifts slightly after reading the TUV testing results. This comprehensive test, with over 600 sets of tires, concludes that the Pilot Super Sport out performs all its competitors in the wet with the single exception of the Pirelli P Zero. Perhaps the most conclusive test comes courtesy of almost identical Porsche 997 Carrera S models. Like the Audis and BMWs before, the only difference between the two are the tires. One wears Pilot Super Sports and the other Bridgestone Potenza S001. I have a good deal of respect for the Bridgestone Potenza tires. I like their RE040 and RE11 models and my understanding is the S001 is their new top-end ultra performance tire. Once I feel comfortable with the circuit layout, I really push both tires to the limit. Both are great performers and a tribute to how far street tires have come. Unfortunately, no matter how nicely I ask, I’m forced to leave the PSM engaged while the Porsches are in Sport Plus mode (in other words, a mild version of traction control is riding shotgun). Even still, I’m able to push the Michelin Pilot Super Sport right to the limit and maintain very high corner entry speeds. Floating the car into a tricky, decreasing radius corner I still have good balance and mid-corner grip. Trying the same moves in the Porsche with the Potenza S001 and the PSM noticeably engages mid-corner and reduces my accuracy as compared to the Michelin. Lastly, the Bridgestones seem to “hunt” in the hard brake zones whereas the Michelin feels more planted under braking. In my opinion, the Pilot Super Sport feels more like the Pilot Sport Cup on the dry handling course. I think there are a couple of reasons why. Michelin’s best kept secret (up to now) is their use of a para-aramid synthetic fiber that previously was seen only in aerospace, military and body armor applications. This material, known as “Twaron,” is woven into the construction of the Super Sport. The number of weaves, their shape and tension help to control the shape of the tire under load. This results in a reduced outer shoulder temperature and the ability to transfer that heat more evenly across the face of the tire. All this tire “technology” allows Michelin to maximize the dynamic contact patch and maintain more of the tire flat on the pavement. At the end of the final day I spend a good deal of time in a 997 S on a "free drive". For once there are no choreographed tests, no comparisons with selected tires, just open track time with a car I know very well. I drive track cars and race cars on DOT R compound tires and full racing slicks. In comparison a street car with street tires should seem a bore, but it’s quite the contrary. The Porsche is stable and predictable with excellent initial turn-in and mid corner grip. I’m able to get to power early and maintain it through track out. Prior to this trip I thought a street tire with a 300 tire wear rating, the ability to handle in the wet and this kind of feel and grip an impossibility, yet here it is in the form of the new Michelin Pilot Super Sport. Should You Use Nitrogen in Your Porsche Tires? Nice test, but is this a tire a person that has less than a $330K income can afford? How is this fair? I want that job. Robert, keep in mind this is an “Ultra Performance” tire. It will only be availble for 18″ and up so depending on your application this may not be the one for you. 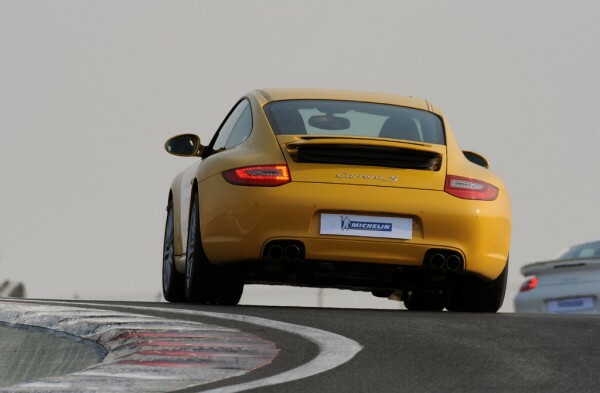 Were the Super Sports fitted to the 997 C2S N-Rated versions or just regular none Porsche approved ones? Andrew, not sure but will find out for you. @ Robert, we were originally told fitments for 18s on up, but I believe they have some 17s available now. I went 5 months without being able to order new Michelin tires for my 993C4S last year. They were out of stock at all the tire dealers in town, the Porsche dealerships, and even TireRack.com. No Michelin options were available! I called Michelin, and they said they were discontinuing several tires and they were not sure when the replacement / new style would be on the market. Thankfully, my tire dealer helped me with a credit and swap for another brand which are better than the PS2s I had. I never “rant” about things – but this was ridiculous. I will never buy Michelin tires again. Drove from Houston to PA with the super Sports that are now not “N” rated. Incredible rains throughout the trip. My 997 Turbo was a bulldog in the rain; Tires were spectacular.